A destination that blends both modernity and tradition, a city that combines the features of the East and West, is the capital of the UAE – Abu Dhabi. If you’re an avid explorer and love discovering new things when on vacations, then Abu Dhabi makes a perfect destination for your next holiday. This lovely capital of the UAE has remarkably gorgeous buildings, tall leaning towers, stunning architecture, highly interesting heritage sites, exemplary Islamic designed structures, lush gardens, and solar cities. There are plenty of handicraft centers and oriental markets exhibiting the finest traditional and cultural artifacts and craft works. Beautiful golden sandy beaches, desert safari, traditional souks, gold shops, luxurious international hotels, huge shopping malls, and some of the biggest water parks are special highlights of Abu Dhabi. If you’re planning a trip to Abu Dhabi to catch the perfect winter sun, there’s no better time than now to know what are the things that you must do in Abu Dhabi and how should you plan the tour well in advance. 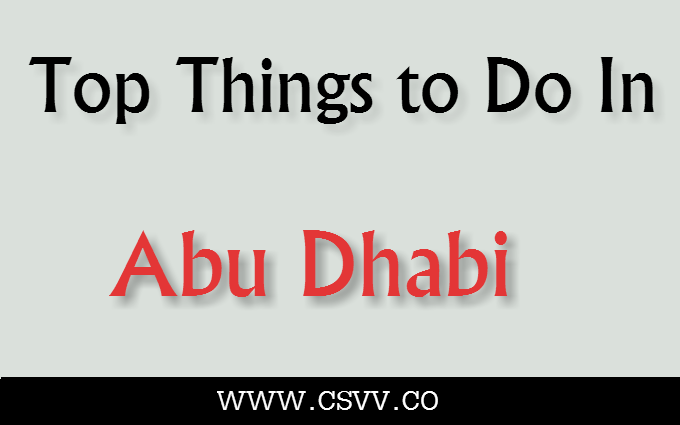 We’re here to help you with the list of the top 10 things to do when in Abu Dhabi! Take a look. Have you ever dreamed of staying with your loved ones on the sands and no one’s there to disturb you for hours? Isn’t it a little exaggerated? No, it’s not at least in Abu Dhabi. Staying on the sands in a five-star resort is nothing but leisure at its best. You can simply sit back and relax on the sand for hours or take a lazy walk on the beach. Your beach stay might also enable you to use a private pool wherein you can take a dip, sipping a glass of wine. To satiate your vacation food cravings, there are a number of good restaurants serving excellent food. The four mile long promenade that forms a spectacular curve on the Western side of Abu Dhabi is worth exploring with your loved ones. Located at the Corniche Road, the prom offers several spots to stop by while walking. There are separate cycle paths, parks, fountains, cafes, and entertainment areas. You can also rent a bike and drive along the prom. The most special highlight of this area is the Capital gate Building that’s astonishingly leaned in 18 degrees. Another big thing to watch here is the huge Flag of Emirates on a 360 feet tall pole. No vacation is virtually complete without a little or more adrenaline rush, which is why you must drive your adventurous spirits in Abu Dhabi too! The Island of Adventure is especially meant for thrill-loving tourists like you. Located near the airport, Yas Island is the hottest adventurous spot in Abu Dhabi and around. Many rides will actually scare you, yet are irresistible. Ferrari World and Water World are the next must visit spots. If you wish to visit the Formula One Track in Abu Dhabi, you can definitely get a chance at Yas Island! Wooden dhows are an indispensable part of the UAE tradition, culture, and heritage. You must not miss the dhow cruise dinner in Abu Dhabi because the luxury of a buffet dinner set on a fabulous traditional wooden double Decker dhow is simply an incredible experience. The cruise, though traditional, comes along with all the modern amenities for tourists. Enjoy a lovely evening, have a scrumptious dinner on-board, and enjoy the breathtaking sights of Abu Dhabi in all its glory. With a glorious history and interesting past, Abu Dhabi preserves its bygone in form of a Heritage Village run by the Emirates Heritage Club. The village is beautifully located at the breakwaters. You can have a look at the wonderful desert life recreated through exhibitions, museums, photographs, stalls, camels, spice shops, crafts, artwork, and typical Bedouin tents. No matter if you have a shopping plan or not; the Afghan Carpet Souk is a must visit place. Plenty of gorgeous oriental carpets are displayed here in the souk. You can also take a glance at the famous Majlis style sofas and prayer rugs sold in hundreds of shops. The old market on Mina Road is worth visiting, from where you can head to the vegetable market and fish market. When in Abu Dhabi, you can plan a short kayaking trip in the spectacular mangroves in Abu Dhabi. Get introduced to a unique marine Eco-system and enjoy the sight of breathtakingly beautiful mangroves. This fun is worth cherishing for years to come! The most stunning hotel in Abu Dhabi is undoubtedly the Emirates Palace. Lavish to all new level, the Emirates Palace is home to 100 hectares of lush lawns and pretty gardens. The sandy golden-colored architectural splendor is an immensely rich example of the wealth of the UAE. Enter the palace and you’ll get astonished at the sight of hundreds of adorned dome, about 1002 crystal chandeliers, and jaw-dropping amazing interior designed with plenty of real pearls, original marble, and gold leaves. This is probably one the most popular attractions in Abu Dhabi these days. In Masdar City, the city of future is solely designed to focus on the future objectives regarding environment. It promotes zero carbon development by not allowing vehicles in the zone. The most fascinating thing about this city is it’s completely powered up by solar energy and wind energy. The architecture is too quite interesting, as the narrow alleys lined with many buildings resemble a typical Arabian street. Keep some spare time and visit the Al Bateen Shipyard to try your hand at carving pretty little traditional dhows. It’s only a short walk or drive from the Corniche Road to get to the traditional heritage gem in Abu Dhabi. While skilled craftsmen construct beautiful dhows, you can also ask them a favor to teach you some of their carving skills using their tools. To keep one in your home or to gift your loved ones, you can also buy miniature dhows that are sold in souvenir shops. So, with this list by your side, you can definitely plan your Abu Dhabi tour like a pro. Get ready and book your trip with Rayna Tours! Sagar is a foodie by heart who also loves to explore places on his own. He wants to convert his hobbies into a profession and even aspires to open his own travel website along with a Chinese restaurant.